This salad rivals similar 'Chinese Chicken Salads' commonly seen at restaurants. Napa cabbage takes center stage with a simple dressing made of rice vinegar, soy sauce (I used low sodium), hoisin sauce, toasted sesame oil, and grated fresh ginger. Shredded rotisserie chicken conveniently adds some protein too. For additional color, red and orange bell pepper strips are throw in, along with sliced scallions. 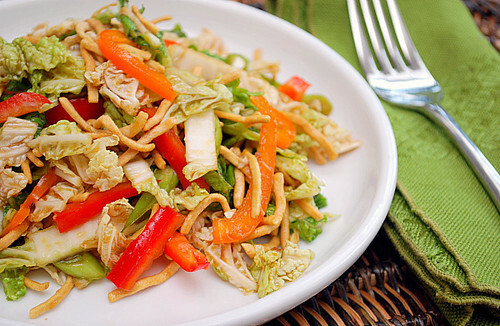 To top it off with some added crunch, chow mein noodles are tossed in and/or used as a garnish. Simple and delicious... what's not to love? Look for rice vinegar, soy sauce, hoisin sauce, toasted sesame oil and chow mein noodles in the Asian aisle of your local grocery or supermarket store. Whisk vinegar, soy sauce, hoisin sauce, sesame oil and ginger together in a large bowl. 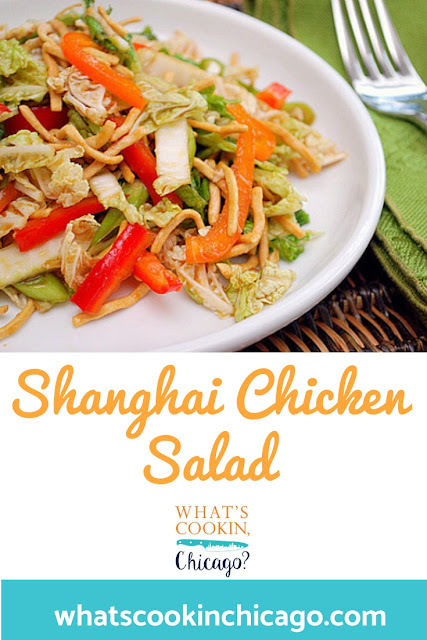 Add shredded chicken, cabbage, bell peppers, and scallions and toss to combine. Sprinkle with (or toss in) chow mein noodles and serve. I love salads like this, thanks for sharing your recipe, it looks so fresh and delicious! I am going to make this tonight, can't wait!! !